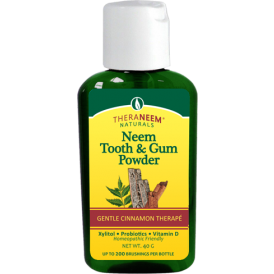 Be flouride free - use neem tooth powder. I remember our first pediatrician back home fondly. Maybe because he was MY doctor when I was little and I thought it was awesome that I now visited him with my own child. He had the doctor look ~ his spectacles hanging over his nose as he talked with me and the bowtie neatly sitting at his neck. The one thing he never failed to ask me at each appointment was Are they Drinking Water with Fluoride in it? Those early years, I eagerly replied Yes! Then, when we started filtering I would gently nod my head because technically we were. Our filtered water did not take out fluoride (though I hated it and was already finding toothpaste alternatives). If he asked me this question today, I would have to say NO! We now use a completely fluoride-free water filter that of course gets rid of all the other gross stuff in water too. It tastes so good I do not like the taste of water as much anywhere else! It has no proven biological use inside the human body (teeth included). Interesting fact on how the use of fluoride even came about…. Gross! Fluoride is a poison – in certain forms it may kill the bacteria in your mouth and this is why it is found in toothpaste. This still doesn’t mean it’s ‘good’. There are many other safer alternatives to keeping your teeth and gums clean! One is TheraNeem Naturals Tooth & Gum from Organix South. It is made with organic supercritical extracts of Neem leaf and Neem bark, also known as the toothbrush twig. Probiotics and Vitamin D3 are added in this innovative product to fortify healthy teeth and gums! Tooth & Gum powder is fluoride, sulfate, gluten and cruelty free! With no artificial flavoring and coloring, it’s suitable for diabetics and children and very homeopathic friendly. I’ve never used a powder before and I was intrigued and wasn’t sure I was going to like it because I didn’t think it would suds up. I was wrong! But did you know that suds are not needed in oral care? It is just what we have gotten used to. It’s the plants and herbs that are doing the good job. Makes total sense! 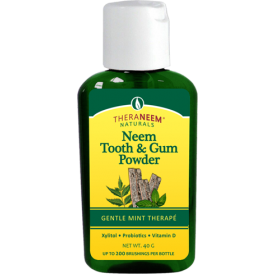 I really like Neem Tooth & Gum Powder and will be spreading the word to give it a try! At $7.99 your first thought might be wow! This will get you through 200 brushings at $.03 per use. Not bad! I received the tooth powder for review and was not compensated in any way and all opinions are my own. Working out in my new Fitness Shoes! Shoebuy.com $50 Giveaway! I'd like to switch to a fluoride free toothpaste. This powder sounds neat though! I'm not fluoride free. Actually I hadn't thought much about it. But I'm definitely interested in switching! I'm not yet fluoride free but I'd like to do that for myself and my family. I think this would be a wonderful product to try out! Oh i am so interested in trying this!! no not flouride free but am always looking for things to help with our teeth and gums!! Not Fluride Free, bit I like this idea!! Thanks for the chance!! Not Fluoride Free, but certainly willing to do more research! I haven't researched alternative toothpastes yet, but have been slowly switching all of our other personal care items (shampoos, hand soaps, etc.) over, so it might be worth looking into this next! I have tried their toothpaste. Powder sounds interesting. I haven't tried it (or even heard of it) before. I've heard of fluoride free but not in a powder form! Interesting info on fluoride - I didn't know that! If you have any links that i can go to and print out to take to my dentist the next time we go, I'd love you forever! We always get a fluoride treatment after our cleanings but if it's not necessary, then we can skip it! I need something to back me up though! LOL I've been going to my dentist since I was 5-6 and even went to school with his son from kinder all the way through HS! I would love to try this . I am interested in the powder form. I've been using flouride free toothpaste for a year or more now, and my teeth seem to be noticeably healthier! I don't go regularly to a dentist, so can't swear by it, but I'm interested to see the comparison next time I go. We are not fluoride free and I am curious as to what a powdered 'toothpaste' would be like. Thank you for a chance to win this. I've been fluoride free for several years now. Really interested to see what it's like using powdered toothpaste! we TRY to be flouride free - we are if we're drinking from the RO filter at the kitchen sink. But not upstairs in the bathroom when we brush our teeth. AND I still have TONS of flouride toothpaste I stocked up on that I need to use (frugal me!) and then we will not be getting more. I always was curious about these tooth powders! Would love to try it! I am flouride free but have never tried a tooth powder. Sounds like something I'd like. Oh my goodness, I looked up flouride when my Dr. prescribed it to my daughter and I couldn't find much anti - flouride so I've been giving to her everyday. Wish I had read this sooner. Now i'm freakin out! Oh and I would love to try this. 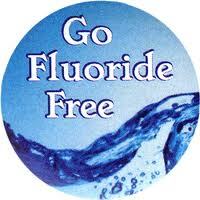 we are fluoride free! have been for 5 years :) Would love to try this! Great products. I love Thera-Neem. Yes, we're flouride free. And have been wanting to try the powder since you told me about it months ago, just have never gotten around to ordering. We are really trying to be - unfortunately, it's in our water here :( Wish they would ban this stuff - forget the soda, take care of this first! and I'd love to try it! Tooth powder? Hmm... I'm def interested in trying it! I can't stand flouride so I'd love to give it a try.